Many people tell me they cannot find prices for Dyna-Ski Boats on line. This is a true statement and the reason I don't post prices on line are many. Here are some of them: Everything we build is custom made to order so it is hard to have an MSRP on custom products and it seems no two boats are ever exactly the same. I would have to keep updating the prices as the cost of materials keeps changing (increasing), trailer prices vary, motor prices vary widely, etc. In short it is nearly impossible to have set prices unless you have a big markup and you can absorb smaller increases in costs. I am not saying that many boat companies have a large margin on their package MSRP pricing but they must don't you think? I normally reply from info@dyna-ski.com but I like to carry on conversations from my long time home email address which I will send you in the first reply. 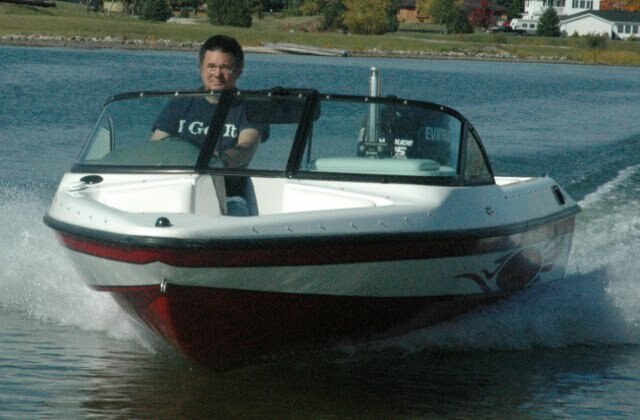 If you want a great price on a Dyna-Ski Boat you will get one when you shop for one. Telling me your honest time frame is a good idea as many special deals I have go away very quickly. The special deals are usually on the motor which can save you several thousand dollars. If you keep shopping the prices do normally go up as all prices with products will continue to do except for big screen TV's it seems. The trend I seem to be seeing lately among boat companies is simple. They come up with a low price on a bare bones boat and then over price accessories to make good profit when you upgrade. Sure they build and sell a few basic boats if you push hard to get one but it may not be easy to find one. Dealers like to sell you a boat they have in stock as they know what that boat cost them and is costing them every day it sits in their inventory. A custom made to order water ski boat is exactly what you want and will get as well as being only what you pay for at Dyna-Ski. I'm really an order taker and I do my best to keep prices affordable which gets tougher every day. I give you a firm price that is good for 30 days. Our suppliers are increasing the cost of everything including motors, rigging, steering, trailers, etc.. I will always try to put a water ready package together for a buyer if they have a realistic budget in mind. Often times shoppers may not have done much homework though and then Dyna-Ski prices may seem high as they are comparing new Dyna-Ski Boats to boats purchased in their past and/or older used boats that the owners want or need to sell. The reality is there are a lot of old used water ski boats for sale. Many used boats are very used! Very few if any true used Dyna-Ski boats available though and only a Hydrodyne or two here and there. Hydrodyne last built new outboards in the early 1990's. That's 25 years ago! New boats have a warranty, old boats don't. I sometimes get people shopping for just the boat or hull for various reasons. They have a "great" older motor being one of them. It is often expensive to make a much older motor work on a newer boat. The labor to remove a motor along with all the old rigging and then reinstall it on a new boat is not cheap. Keep in mind that labor is one of the biggest costs other than the materials needed for making the actual boat. The highly skilled fiberglass workers in the shop are not marine mechanics familiar with all the parts and pieces used rigging motors in the past. We also don't want the responsibility of making sure that the older engine ran well before and will run well afterwards. If we have a problem with a new motor we take it to a local dealer for warranty service before you get the water ready boat. This does happen from time to time. So if you want to use your own used motor make a deal with your local marina to do the swapping. Remember it isn't usually cheap. Check their shop rates. Get an estimate. People must think that there is a big markup on the trailers and motors, there isn't in a water ready package. Our money is made on building boats and not reselling motors and trailers. We sell outboard motors and trailers because boats need them. Some of the labor rigging the boat for the motor is done while the boat is being assembled which saves time and money. A replacement or "crate" 350 V-8 motor for a vehicle can be purchased for $1500 or so. I just put a new 350 chevy in my 1970 plow truck. Larger displacement V-8 motors cost a little more depending upon what the buyer wants. My point is that I/O and inboard boat companies motors and very simple running gear costs way less than an outboard motor does. I/O's tend to be cheaper than outboards while inboards tend to be more than Dyna-Ski boats. Both I/O and inboards require way more maintenance every year. Gas prices are down so now is a great time to sell a gas sucking inboard or vehicle. I'm sure the prices of gasoline will increase because the oil companies are now used to making big profit on gasoline sales and when prices are down so are profits.